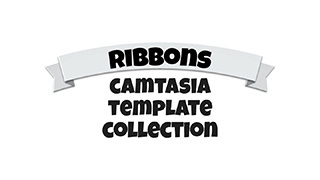 We are proud to present a new Camtasia template collection: Ribbons! It includes 7 different animated ribbon shapes with text in 5 different colors. One of the colors is grey, so you can easily use the colorize function to create any colored ribbon you need for your creative project. Crank up the volume and check out the preview video below. The template resources are transparent so you can place them on any background or video. It is also possible to speed up or slow down the Ribbon animation and animate them with movement. TechSmith Camtasia© is made by TechSmith Corporation. More info: www.techsmith.com. Ribbons Template Collection is an independent Library Asset for Camtasia, made by SoftwareCasa/Callouts. SoftwareCasa is not associated with TechSmith Corp. Ribbons Template Collection for Camtasia can be downloaded by members on www.callouts.com.